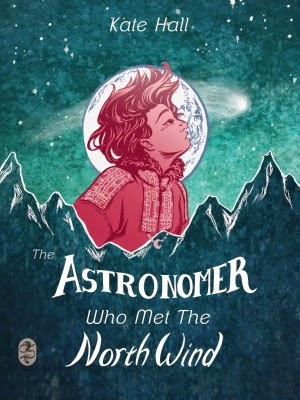 The Astronomer Who Met The North Wind by Kate Hall. Book Smugglers Publishing, 2014. Review copy from publisher. Short story. The Plot: The Astronomer Who Met the North Wind, a short story, is part of the Fairytale Retellings series being published by Book Smugglers Publishing. As you've probably guessed from the title, it's a retelling of The Princess Who Met the North Wind. An astronomer and his wife have a daughter, Minka. Minka's parents go on scientific expeditions; during one, when Minka is six, her mother gets ill and dies. Afterwords, her father is very protective of her, including his insistence that Minka not become an astronomer. When Minka turns twelve, her father gets her the types of gifts he thinks a girl would want and should want. Needless to say, they are not the types of things one girl -- his girl -- his daughter, Minka -- wants. Minka decides to prove him wrong, and gets some help from the North Wind. The Good: All the good things! First, I adore the Book Smugglers so was eager to read one of the short stories they were publishing. Second, I adore fairytale retellings and reinventions. Third, I love short stories in part because it's so nice to be able to sit down and finish a story in one seating. Of course, none of those things are what makes this particular short story a terrific story. What makes The Astronomer Who Met the North Wind fabulous is the writing. Here is Minka, following the disappointing birthday gifts: "Minka leaned on her windowsill and wiped her eyes. Her stomach churned, bitter, and even when she heard her father call her name softly through the door, she let her angry silence answer for her." The North Wind comes along, and both tempts and encourages Minka to leave her home, alone, at night, into the dark and the cold, in order to find a mystery comet before her father does. Even for a short story that is a retelling, I don't want to spoil it. Let's just say, that the North Wind is not what he appears to be. And that Minka has to find her own strength and courage to move forward. What I can say, without spoiling, is that I liked Minka's desire to be an astronomer and that it was shown to be complicated. Even before her mother's death, she's described as a girl who loves geometry and solving puzzles; a gift of a telescope from her father helps her in the days after her mother's death. Her father's not wanting her to be an astronomer is based, in part, in not believing a child really knows what she wants to do with her life, and also in that it's not appropriate for a young girl, but also, just as importantly, in not wanting to lose his daughter. That all these things are shown, so that the father is never portrayed as a villain, and are shown in so few words, is one reason why I love short stories. Kate Hall knows how to use words, and more importantly, knows how to make them count. One last word, one last confession: the North Wind was scary. This sounds like an interesting book! Great review.